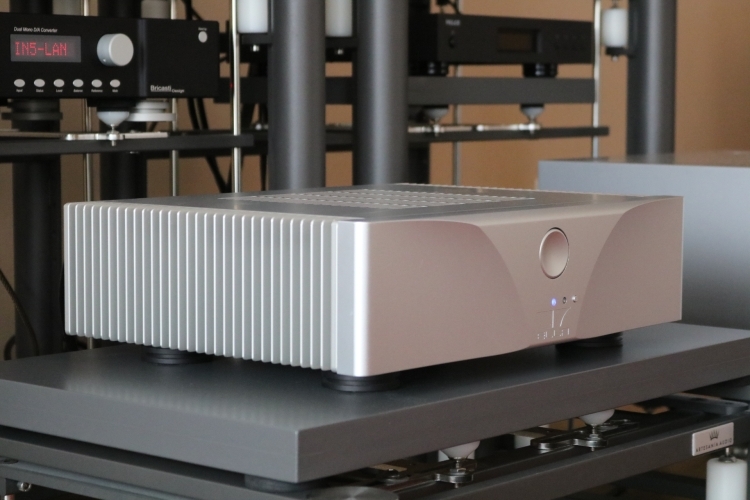 The other day I got a mail from Dalibor of Euphony Audio mentioning that they are going to do the worldwide distribution for a very special hybrid of Class A and Class D amplifier, the Naiu Laboratory Ella. While Euphony Audio is working on Euphony Software and hardware at this moment, Dalibor’s business partner Robert Devcic is currently also working as a marketing director, to help Mr. Mircea Naiu bring his amp to the public. 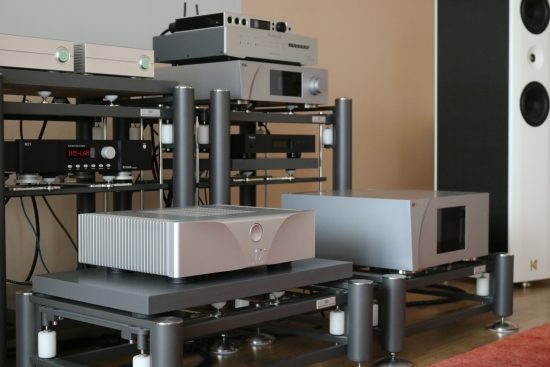 Having reviewed various Jeff Rowland ICE-power and Pascal models, the Audio Physic Strada Mono’s, the Mola-Mola Kaluga N-Core amps, two NuPrime proprietary Class-D designs, and a couple of others, one thing is very clear: you cannot generalize Class-D sound. While there certainly are some common aspects, they all sound different from one another. 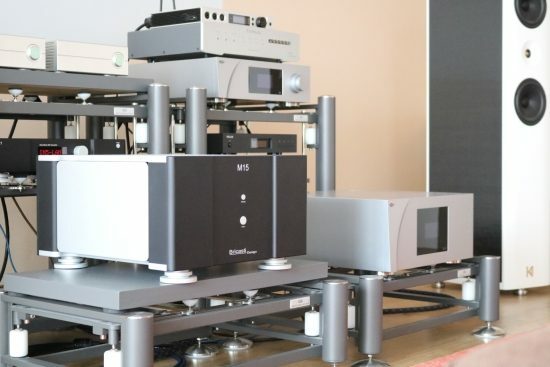 The manufacturers of these amps refer to the technology differently: Class T, Class D, and now Naiu Laboratory with a Class ND. What they have in common is that they use switching technology for the signal amplification. What they are not, however, is digital. Robert provided the following info to clarify the differences between “standard” Class D and the Naiu’s ND Class. The difference between D and “ND” class is like comparing class AB class to class A amplifiers. Both can be very good, but in my opinion they are quite different in architecture. AB class rarely can work without proper negative feedback circuit or some kind of correcting circuit, while A class tends to be “less” feedback oriented – which in my opinion outputs more of the music. In this respect, ND differs from class D – same as class A does from class AB. In D-class domain, the feedback loop plays a great role, as well as the output filters (to remove the switching frequency). Standard D-class usually amplifies signals up to 50kHz and uses “brick wall” filters to exclude any influence of the switching frequency into audio frequency. By using such filters, they produce output with recognizable group delays. ND class amplifies signals up to MHz range. Also, output filters here are active at a much higher frequency and they are not brick wall type filters. This results in phase errors that practically can be 0.00020 degrees at 20Hz and 0.030 degrees at 20kHz, which is nearly perfect. By not using “brick wall” filters and filtering at higher a frequency, the effects of output filters are not present in the audio range. Also in ELLA we combine a very special 4 KW power supply with ND class amplification architecture. In this combination, we are very confident to drive almost any kind of home speakers while keeping the original phase and frequency integrity of the signal. The effect can be experienced with very best speakers like Magico and YG acoustics, which have complex crossover networks used to retain phase coherence of the signal where the drivers overlap. 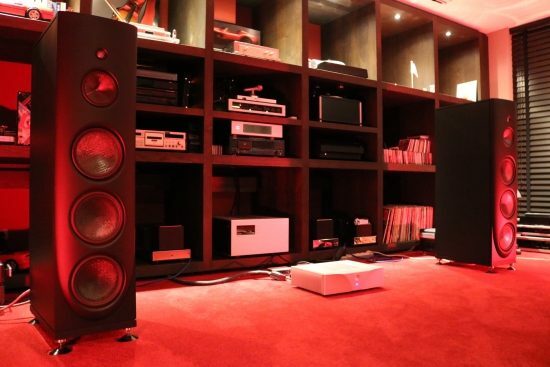 Another spectacular effect of phase coherence can be experienced with speakers like LEEDH which excel with their near-perfect piston-like drivers. Lastly: Modern D-class amplifiers are “compensated” devices. Using 7th order compensation they are all working very well, however, just one or two models can excel in sound. ELLA, on the other hand, is not compensated at all. Even without using compensation networks we can approach the sound of modern A/AB class amplifiers. 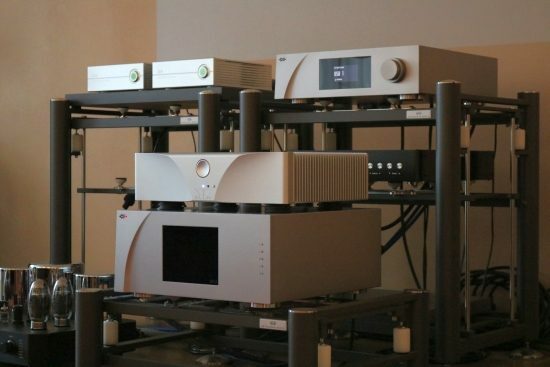 We think this is a big advantage for producing even better ND class amplifiers in the future. The below information by Mr. Naiu is taken from the Naiu Laboratory website, slightly shortened and paraphrased for better readability. The idea behind the Ella amplifier is to develop an amplifier capable of amplifying arbitrarily fast signals without altering them. To accomplish this, Naiu Laboratories had to adopt a new path, different from the one threaded by many that came before. It was quickly clear that the bandwidth of an amplifier had to be considerably larger than the range of audible frequencies which are assumed to reach about 20 kHz. To obtain almost no alteration and only minimal phase shifts between input signals and output signals in the audible range and far above it (200kHz), a very high power bandwidth of at least 1 MHz was required. In short, an amplifier has to operate extremely quickly in order to avoid alteration of the high-frequent signals and thus, the quest emerged for a very short signal rise time. It was impossible to implement these requirements using the established amplifier technologies because the power transistors were destroyed in the presence of high frequencies, due to unavoidable component differences, the temperature-dependent shift of characteristic curves, and unavoidable minimally different transistor switching times. Furthermore, the modern-day requirement for energy efficiency had to be considered. In order to eliminate these problems, it was necessary to develop an intelligent concept. The aim was to unify the advantages of Class A technology as well as Class D technology, without their disadvantages. It took years of fundamental research until this aim was accomplished. A patented circuitry was the result, which doesn’t fit in any established matrix. Because there was nothing adequate, we just called it Class N as an abbreviation of Class Naiu. Since Mircea Naiu is the inventor of the Class N technology as well as the current technology of the ELLA amp, accordingly, Class ND stand for Class Naiu Digital. With 450W @ 4 ohms and 840W @ 2 ohms, the Ella amp is very powerful. It is also very robust, resistant to shortcircuits, and has circuitry for protecting the speakers. Current draw is continually sensed and fault situations detected and if needed, the amp will shut down its power supply very quickly. 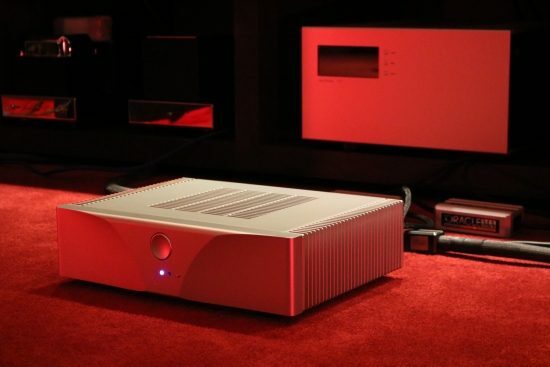 According to the maker, the ELLA amplifier reaches the tonal advantages of the Class A technology with an efficiency of around 80% which resides in the area of pure Class D amplifiers. Since the amp is firmly aimed to compete with much costlier designs, I will compare it directly to a wide range of amplifiers using the affordable NuPrime ST-10 and Audio GD Master 3 on one end and the much more costly Bricasti M15, CH Precision A1.5, and finally the extremely costly Soulution 711 on the other end. The initial system in which the Ella will be assessed consists of Kroma Audio Carmen loudspeakers and a CH Precision C1 DAC/Controller. Cables are Final Touch Audio Ganymede and Vermouth Audio Reference, two cables that are sonically far apart but as it would turn out both work very well with the Ella amp. Speaker cables used at first were the Jorma Design no.3 and later the Furutech Nanoflux. In spite of the exotic alternatives that I have at hand, the Ella impressed me right from the first moment that I used it, cold from its wooden crate, with a firmly rooted, sonorous, smooth, fluid, and slightly warm delivery. So, Class A sound with the benefits of Class D? Judging from my first impressions, that certainly doesn’t seem like a hollow claim. Most impressive, besides the warmth, is the fluid and super-smooth treble. Absolutely not harsh, capped, or low-res and certainly not square-ish, it is remarkably gentle and refined. So far, the only switching amplifiers that I heard that also had very refined treble were the ~12K Mola Mola Kaluga’s but these two amps’ characters could not be more different otherwise. Perhaps it’s best to refer to the Kaluga’s as having no character at all. Akin to, for example, Magico loudspeakers, they just don’t seem to impart any sound of their own, leaving the music to speak for itself. Depending on the circumstances, therefore, the Kaluga’s and Magicos can both sound pretty squeaky clean, too clean for some tastes indeed. So, even though the Kaluga’s are pretty much devoid of character, their cleanness still as an aspect that makes these products stand out. The CH Precision Balanced Link XLR cables worked well but the Vermouth Audio Reference XLR interlinks made the Ella sound most sonorous while providing the maximum slam. When talking about resolution specifically, I can’t avoid pointing out that the Ella does not provide the extreme transparency and low-level resolution of the Kaluga’s, nor can it approach the ultra-refined and retina-like presentation of the 33K CH Precision A1.5. Extreme resolution such as in the case of the Kaluga’s or the A1.5 also means a very clean and tight sound and this, in turn, is quite revealing of the recording quality and the quality of the source components. The Ella, on the other hand, has an easy-going and forgiving sound that does not tend to work in an analytical manner, even if the amp still has very good resolution. 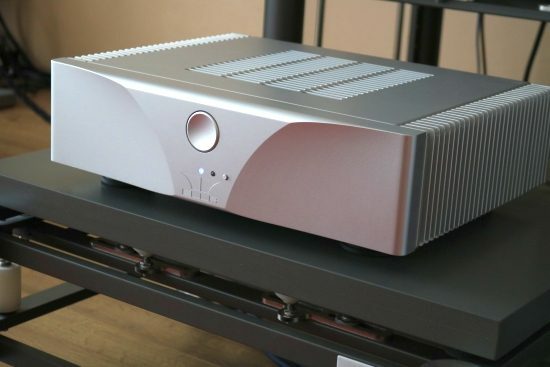 An amp that I am currently also reviewing is the 20K Bricasti M15, a “traditional” linear Class A/B design, executed to a very high-quality standard. Smooth and a touch warm, the Bricasti is still essentially neutral and quite transparent, threading a fine balance between resolution and relaxed musicality and I think many people will like this sound a lot. But this amp is over twice as expensive as the Ella. An interesting thing is that, even though the Bricasti is a linear Class A/B amp, the switching Ella amp sounds even more full-bodied in the bass and also warmer in the midrange. I wouldn’t call the M15 dry (it is actually smoother than the A1.5) but, compared to the Ella’s smoothness, it kind of is. 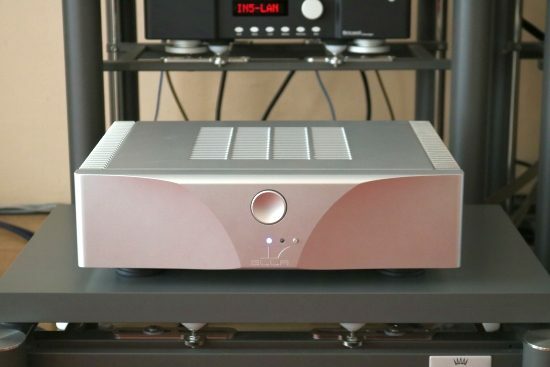 Moving to the affordable territory again, the 2200 euro Audio GD Master 3 is not as highly resolving or as nuanced but it has a similarly clean and even-handed balance as the CH Precision. Apart from the resolution, the aspect to stand out most compared to the A1.5 and the M15, is its bass, which is accurate and fast but quite lean, especially when compared to the Ella’s bass performance. 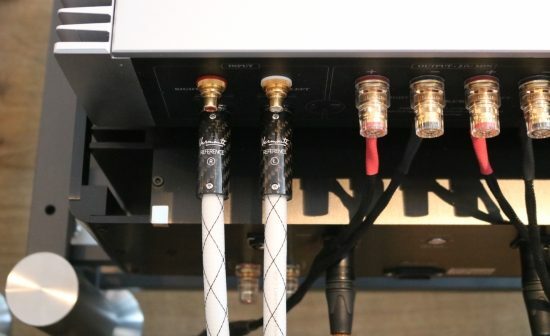 One thing that the three Class A/B amps have in common is that they are texturally more fleshed out than the Ella, especially in the midrange, in spite of sounding cleaner and relatively drier. It’s a kind of inner resolution and harmonics which is something that I often find is better with Class A/B designs than with Class D designs. I can’t be sure if the Ella actually delivers the truth and the linear amps “add in” parts or if it is merely a matter of getting accustomed to but, in any event, the A1.5, M15, and Audio GD alike, sounds more continuous, more, well, “analog”, if you will. To me, the Ella can sound a little bit too quiet between the notes. Incidentally, the Kaluga’s, while fluid and supple, behaved similarly and also sounded extremely quiet between the notes. So, this particular aspect is not particular to the Ella either, but pretty much a common divider between linear and switching amplifiers. Naturally, the Ella has superb bass performance. That is almost a given for switching amp designs. However, the Ella’s bass deviates from that of the majority of Class D amps by being much more voluptuous and more rounded, fuller, and more sonorous. The Nu-Prime ST10 is also an amp that sounds bolder and more solid than most other Class D designs, as well as many Class A/B designs but the Ella’s bass is different. It is much more akin to that of a Pass Labs or Bryston amp, or the McIntosh amps before the company’s takeover: less articulate than the CH Precision, or the NuPrime, for that matter, but ever so big, beefy, and juicy. The Ella amp is not fussy about cables at all: it worked beautifully with anything that I connected. At first, the speaker cables were the Jorma Design no.3 which are clean and transparent themselves but let the Ella’s richness and smoothness through entirely unharmed. The Furutech Nanoflux speaker cables that I tried later are quite smooth-sounding themselves but they still allowed the Ella to sound as articulate and agile as it can do. Between these two cables, I’m not really sure which ones were ultimately the best overall match. If it comes down to the best bass articulation then the Jorma wins but if it comes down to texture and tonality then the Furutech wins. All the interlinks that I tried worked very well, even the dry-sounding CH Precision Balanced Link XLR cables, so it really comes down to personal taste. The Final Touch Audio Ganymede XLR provided the best treble performance with the airiest and most free-flowing delivery while the Vermouth Audio Reference XLR provided the most sonorous and solid delivery. So far, it is clear that the Ella works extremely well with the Kroma Audio Carmen speakers but then, they are quite efficient and are hardly taxing of amplifiers, so I figured, why not pay audio buddy Niels another visit, to see how the Ella fares with his Magico Q5’s? For the final part of this review, I drove to Niels with the Ella amp, to see how it would perform with his Magico Q5’s, which are notoriously hard to drive. 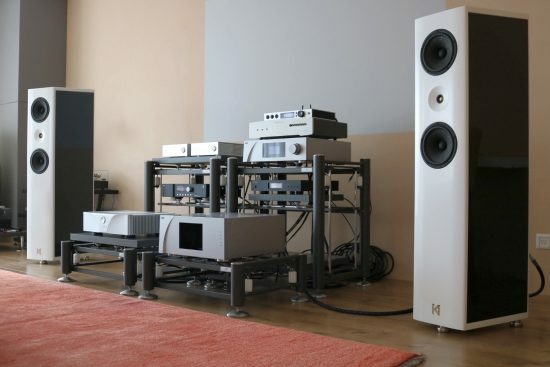 Normally connected with a Soulution 711, the Magico’s should not reasonably be expected to sound as good as they do when driven by the 55K Swiss amp but that’s the beauty of this audio passion: you just never know! Like my own system, Niels’s system tends to change from time to time, but lately, it is quite stable. 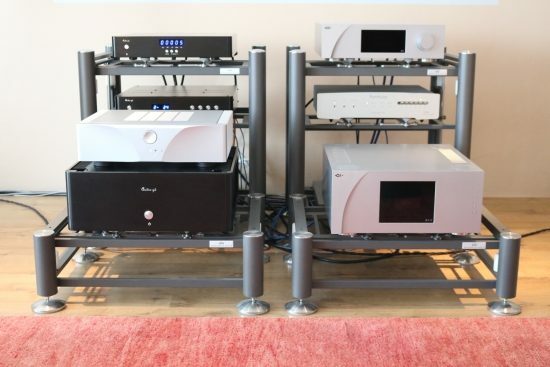 In use were a Spectral 30SV preamp, Aurender S10 music server, connected to the Zanden 5000 Signature DAC via an MIT Oracle MAX digital interlink, Soulution 711 power amp, and Magico Q5 loudspeakers. Cables between Zanden DAC and preamp are MIT Oracle MA cinch, XLR interlinks between pre- and power amp are MIT Oracle MA (with impedance setting “MID”) and speaker cables are MIT Shotgun Evo. The power cable for both amps is an MIT Z-cord II, which is a Belden 19364 with a ferrite ring inside a very big plastic cover. After having familiarized myself with Niels’ system using a selection of my music in a playlist on his Aurender S10, we swapped the amp and with much anticipation, resumed listening. Well, I’ll be… this was not bad, not bad at all! The 711 is very solid and sonorous as well as colorful but I wouldn’t call it warm. As heard at my place, the Ella is certainly smoother and warmer, also in the context of Niels’ system. And just like in my own system, the Ella has an immediately likable sound that is not only smooth and warm but also beefy and solid. And even when turning up the volume, the amp clearly had no issues driving the Q5’s. The danger of using such a high-res system, though, is that deviations from what we regard as the reference, the 711 into the Q5’s in this case, are laid bare very clearly. And, indeed, the Ella can’t keep up with the 711 in various aspects such as resolution, articulation, and dynamic expression, to name a few, resulting in a delivery that is less fascinating and captivating, than it can be. Of course, just like the CH Precision, the Soulution 711 is simply in another Class and let’s be honest: at 6x the cost of the Ella, it better be. But still, it is remarkable for what the Ella does achieve at its relatively modest cost. Finally, overall presentation aside, there’s actually an area in which I found that the Ella was performing better than the 711. Can you guess it? Oh, I’ll just say it: the Ella is not only sweeter but also more fluid in the treble. That a switching amp would sound more fluid than a 55K Class A/B behemoth, will probably raise an eyebrow here and there but there you have it: as always, every audio component has its pros and cons. 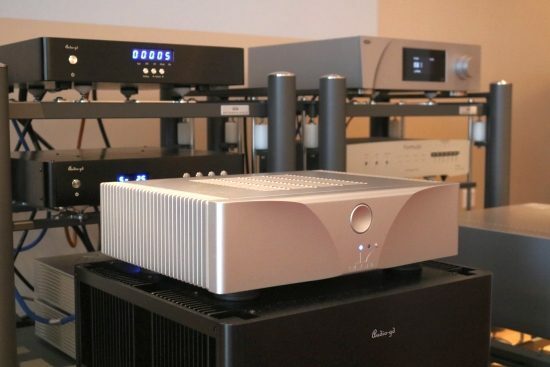 Mr. Naiu is not boasting a hollow claim: the Naiu Laboratory Ella amp does indeed deliver Class A sound with the benefits of Class D. While it can’t be expected that this 8K amp actually beats the competitors costing many multiples of its relatively sane sticker price, it still is surprising that the gap is not larger than one would expect. Moreover, it is quite amazing how close this switching design gets to sounding like a true Class A Pass Labs amplifier in terms of vividness and lack of distortion or a big Class A/B Bryston or McIntosh, in terms of sonority and overall bass performance. So, while perhaps not world-class in all of its aspects, this amp’s smooth and warm, yet powerful delivery is a far cry from the cool sound of most other switching designs. The amp is not fussy about cables, although its sound can certainly be tweaked according to personal preferences.